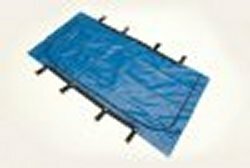 Our HEAVY-DUTY Disaster Bags, with a Envelope opening, are manufactured in the U.S. of vinyl laminated polyester fabric. The material will not tear, even if punctured, and is impervious to blood and body fats. Will hold over 300 pounds. The H-D nylon zipper is completely sewn with nylon thread for better durability and comes with a custom made lockable slider for easy opening and closing. Autopsies and x-rays can be preformed within the pouch. All seams are dielectrically sealed to prevent leakage. Each pouch is individually package in a 24" x 24" H.D. poly bag along with a bio-hazard tag. Each has a ten (10) year shelf life and is guaranteed against defects.